Please advise me of any retirements or deaths. Mary; Sally; Lucy Anne; Arabella; Elizabeth. Margaretta Ussher; Julia Anna; Rebecca; Lucy Ussher. Mr Davis added the additional name of GOFF in 1845, under the terms of his uncle's will. Mr Davis-Goff was created a baronet in in 1905, denominated of Glenville, County Waterford. Annabel Claire; Julia Christian; Alice Maria. Residences ~ Ballinacor Estate, County Wicklow; Lissen Hall, Donabate, County Dublin; Eairy Moar Farm, Glen Helen, Isle of Man. WARRENPOINT, County Down, stands at the mouth of the river Newry into the head of Carlingford Lough, and on the road from Newry to Kilkeel. It is three miles west of Rostrevor, seven miles south-south-east of Newry, and 44 miles south-south-west of Belfast. Its location affords brilliant and noble scenery; and, in particular, commands a splendid prospect eastward of Rostrevor and the Mourne mountains. The town comprises a square and several radiating streets, though appears from some vantage-points to extend simply along the edge of the water. It has been almost entirely built since 1780, and has the remains of a large windmill which stands nearly in the town centre. A rabbit warren once existed on the shore and it would seem reasonable to assume that the town takes its name from that warren. The nearest country seat is Narrow Water Castle. 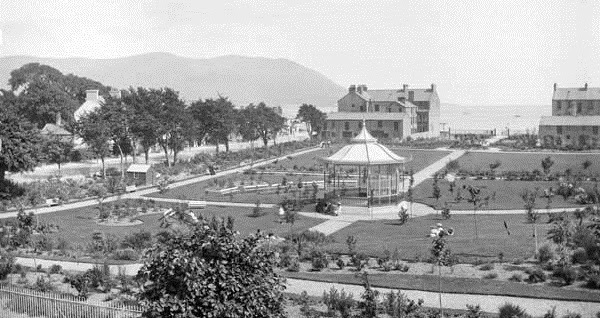 The municipal park at Warrenpoint, County Down, was recently awarded a heritage lottery grant of £932,000. Warrenpoint Park is one of fifteen historic parks and cemeteries across the United Kingdom to achieve the funding. Opened in 1906, many of the park's original features are deteriorating and are in danger of being lost. This project will conserve the listed bandstand, restore the 1930s pavilion and regenerate the gardens, paths and walkways. More recent additions such as the play park, tennis courts and events space will also be refurbished and modernised. This is a fine example of a typical Victorian public park, though laid out from 1900. It retains many original features and plants, yet successfully incorporates later intrusions such as the Children’s Playground. It lies in a mild spot close to the waters of Carlingford Lough but is sheltered by buildings. Mature trees surround the park on the three sides and edge the formal central cross paths. Solid wall-mounted iron railings enclose the whole. On slightly rising ground to the north west, there are circulating paths, lawns, neat shrub borders and well dug beds of seasonal bedding plants. 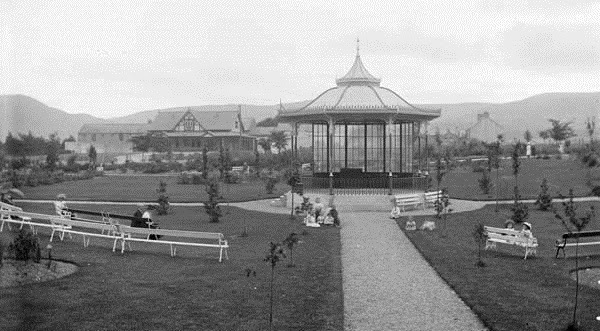 The park was designed by Thomas Smith of the Daisy Hill Nursery, Newry. The central bandstand of 1907 is elaborately decorated. Wooden rose pergolas give vertical interest. Tennis courts lie on flat ground at the south west end. The toilet block, lodge and gardener’s bothy are early buildings. First published in January, 2014. Armagh, the Orchard County, is an inland county of Ulster, extending from Lough Neagh to the northern boundary of the Irish Republic. It is bounded, on the north-west, by County Tyrone; on the north, by Lough Neagh; on the east, by County Down; on the south by County Louth in the Irish Republic; and on the west by County Tyrone, and County Monaghan in the Irish Republic. The boundary line, on the north-west, is the River Blackwater; on the north, is of course the shore of the greatest lake in the British Isles. From Lough Neagh to Knockbride, a distance of about nine miles, is a series of well-defined enclosures through beautiful and highly improved countryside. 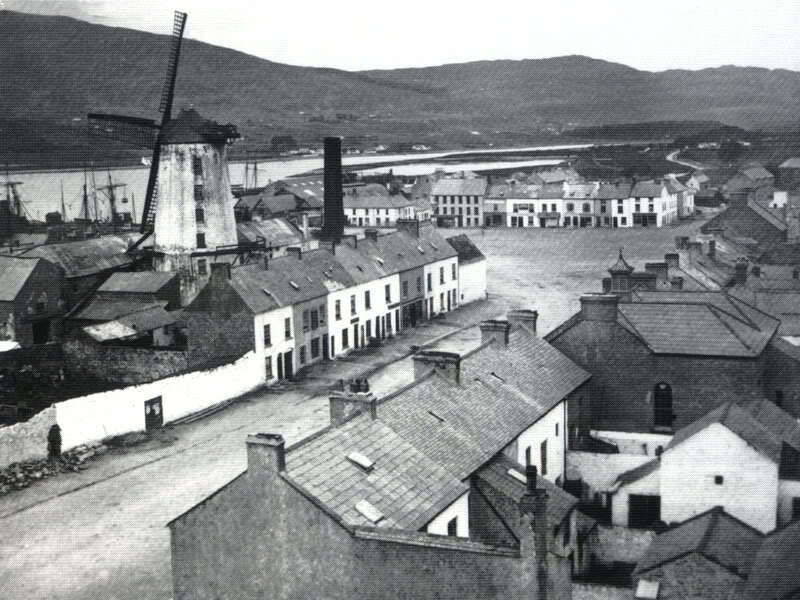 From Knockbride to the head of Carlingford Bay, or along much of the greater part of the east, is the Newry Canal. Along most of the south is a series of water-sheds, streamlet courses, miserable enclosures and imaginary marches, aggregately ill-defined, and extending across so bleak, wild and barren a district as to afford small inducement for its being accurately ascertained. Along the north-west and west, over a distance of about 20 miles, is retrogradely the River Fane and one of its tributaries; whereas over the next four miles, a chain of poor fences and naked ditches. Along the remaining distance down towards Lough Neagh is an affluent of the River Blackwater to Caledon, and the Blackwater itself to Lough Neagh. Its form is a parallelogram of 24 miles by 11, with a considerable triangular protrusion at the north-east corner, a smaller triangular protrusion at the south-east corner, and a large, curved expansion of 14 miles by 7 on the west side. Its greatest length, from Maghery on Lough Neagh to the townland of Dromlece [sic], near Foxfield, is 25 miles. Its greatest breadth is from Scarva on the Newry Canal to the boundary with County Monaghan near the village of Glaslough is upwards of 16 miles. The county's circumference is about 80 miles; and its area about 300,000 acres. Slieve Gullion, at a height of 1,880 feet, is the highest mountain. Select bibliography ~ Parliamentary Gazetteer of Ireland, 1841. Mr Hely-Hutchinson obtained a peerage for his wife, CHRISTIANA, as Baroness Donoughmore, of Knocklofty, County Tipperary, in 1783. RICHARD HELY (1756-1825), 2nd Baron; advanced to a viscountcy, as Viscount Donoughmore; and further advanced to the dignity of an earldom, in 1800, as EARL OF DONOUGHMORE. Kathleen Alicia; Frances Margaret; Jane Louisa. Nina Blanche; Evelyn; Norah; Margarita Oonagh Isabella. RICHARD MICHAEL JOHN (1927-), 8th Earl, who sold Knocklofty Estate in 1985. 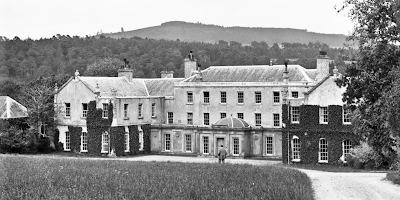 KNOCKLOFTY HOUSE, near Clonmel, County Tipperary, was the mansion of the Earls of Donoughmore. The estate is almost four miles west-south-west of Clonmel. The mansion stands on an extensive natural terrace on the left bank of the River Suir. It commands a delightful prospect of the richly wooded slopes and highly adorned rising grounds of the Waterford side of the valley. The demesne is - or was - extensive, containing some of the finest old elms and limes in the counties of Tipperary and Waterford. The 18th century mansion comprises a three-storey central block, with two-storey, gable-ended wings projecting forward on the entrance front to form a three-sided court. The centre block consists of seven bays, and the wings comprise two bays in their gable ends. In the early 1800s a single-storey corridor was built along the front of the centre block, joining the wings, embellished with wreathes and Doric pilasters. The central garden front, overlooking the River Suir, comprises five bays with an exceptionally long, two-storey service wing. The demesne spreads across the River Suir into County Waterford, including Kilmanahan Castle, formerly a separate property. The original, intricate gate piers are notable. 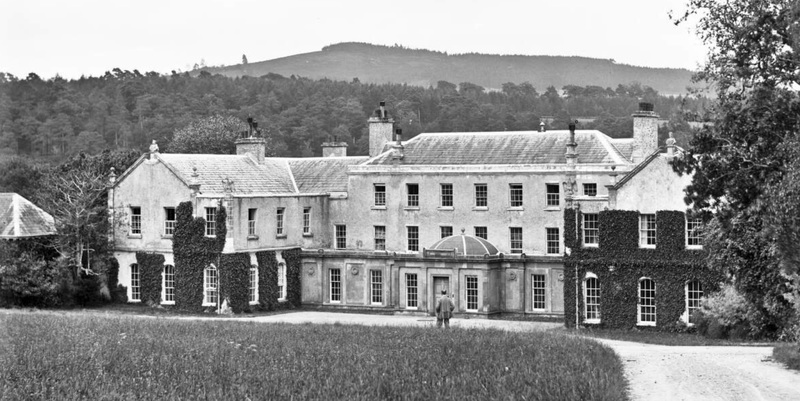 The 7th Earl and Countess were kidnapped from Knocklofty House in 1974 by an IRA gang and held captive for four days before being released in Phoenix Park, Dublin. The family sold up several years later. The estate was recently for sale. Other residence ~ Palmerstown House, near Dublin. 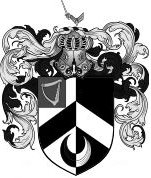 Donoughmore arms courtesy of European Heraldry. SIR BASIL BROOKE (1567-1633), Knight, of Magherabeg and Brooke Manor, County Donegal, went over to Ulster during the reign of ELIZABETH I. Sir Basil served under Charles Blount, 8th Lord Mountjoy, and was appointed governor of the town and castle of Donegal. He was likewise one of the commissioners for the settlement of Ulster, and obtained from the crown large grants of land in County Donegal. SIR HENRY BROOKE, Knight, of Brookeborough, County Fermanagh, also governor of Donegal, High Sheriff of County Fermanagh, 1669, and MP for Brooke's Borough. This gentleman received, in recompense for his services during the rebellion of 1641, grants of lands in County Fermanagh. Sir Henry married firstly, Elizabeth, daughter of Captain John Wynter; and secondly, Anne, daughter of Sir George St George Bt, of Carrickdrumrusk, County Leitrim. For his third wife, Mr Brooke espoused Elizabeth, daughter of Henry, Lord Docwra. THOMAS BROOKE MP, of Donegal, Major in the Williamite Regiment of Foot, who wedded Catherine, daughter of Sir John Cole Bt, of Newlands, County Dublin, and sister of Cole, Lord Ranelagh. 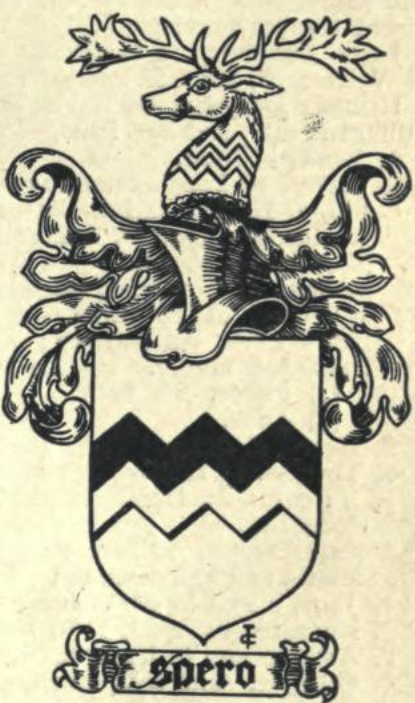 HENRY BROOKE (1671-1761), of Colebrooke, MP for and governor of County Fermanagh, who married, in 1711, Lettice, daughter of Mr Alderman Benjamin Burton, of the city of Dublin. HENRY BROOKE (1770-1834), of Colebrooke, County Fermanagh, who was created a baronet in 1822, denominated of Colebrooke, County Fermanagh. SIR BASIL STANLAKE BROOKE, 5th Baronet (1888-1973), KG, CBE, MC, who was elevated to the peerage, in 1952, as VISCOUNT BROOKEBOROUGH, of Colebrooke, County Fermanagh. The Brookes of Colebrooke remain one of the oldest landed families in Ulster. The Brookeborough Papers are deposited at the Public Record Office of Northern Ireland. The Rt Hon Sir Basil, 5th Baronet, was the third Prime Minister of Northern Ireland. His second but eldest surviving son, John, 2nd Viscount, and 6th Baronet, was also a notable politician. Alan, 3rd and present Viscount and 7th Brooke Baronet, succeeded in 1987. 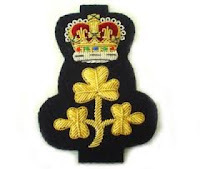 Lord Brookeborough is a Lord in Waiting to HM The Queen and Lord-Lieutenant of County Fermanagh. First published in November, 2010. 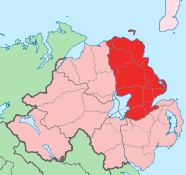 A maritime county in the extreme north-east of Ulster, bounded on the north by the Atlantic Ocean; on the east by the North Channel; on the south-east and south by County Down; and, on the west by counties Tyrone and Londonderry. 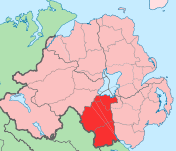 Its boundary over all the south-east and south, excepting five miles adjacent to Lough Neagh, is formed by Belfast Lough and the River Lagan; and, over all the west, excepting seven miles adjacent to the ocean, is formed by Lough Neagh and Lough Beg, and the River Bann. The county is thus clearly insulated between a sweep of the sea and an alternate chain and line of fresh water. Its greatest length, from Bengore Head (near the Giant's Causeway) on the north to Spencer's Bridge on the south, is about 42 miles. Its greatest breadth, from The Gobbins on the east to Toome on the west is about 24 miles. Trostan, at 1,808 feet, is the highest mountain. The county's area is approximately 745,000 acres. Select bibliography ~ Parliamentary Gazetteer of Ireland. 1841. To be a Deputy Lieutenant of the County, his Commission bearing date, the 30th day of December, 2017. THOMAS BAKER, the first of this family who settled at Lattinmore, County Tipperary, went over to Ireland with the Lord Deputy, the Earl of Sussex. His widow, Anne Baker, who was living at Knockroid, Barony of Clanwilliam, 1642, put in her claim, and that of her son, Walter, as sufferers in 1641. 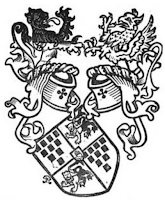 WALTER BAKER, entered Trinity College, Dublin, 1640, aged 17, as second son of Thomas Baker, of Lattin, born at Ballincallagh, 1623. He obtained a re-grant from CHARLES II of the lands at Killenaliff, Lattinmore, and Lattinbeg, Yorticord and Kilpatrick, County Tipperary, containing 1,200 Irish acres. This patent was enrolled in 1677, and it states that the lands were in Thomas Baker's possession "long before the Great Rebellion" of 1641. He wedded Martha Osborne, and left issue, three sons and two daughters. RICHARD BAKER, of Lattinmore, County Tipperary, succeeded his father. WILLIAM BAKER, High Sheriff of County Tipperary, 1726, who purchased, in 1700 (from Colonel Blunt), the estate of Lismacue. WILLIAM BAKER, of Lismacue, who espoused Elizabeth, daughter of Sir Thomas Roberts, 1st Baronet, of Britfieldstown, County Cork, but dsp. Marion Elizabeth; Anne; Elizabeth Henrietta; Mary Rachel. Alice Maud Massy, b 1883. He wedded secondly, in 1935, Julia Dorothy, daughter of William Parry Evans. KATHERINE (Kate) RACHEL BAKER (1952-), of Lismacue, who owns and manages the estate with her husband, James Nicholson. 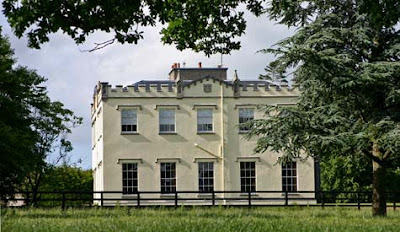 LISMACUE HOUSE, near Bansha, County Tipperary, was completed in 1813 to the design of William Robertson. William Baker purchased Lismacue in 1705 from Charles Blount and the estate has been owned by his descendants ever since. The house is two-storey building over a basement in a mildly Tudor-Gothic style that is far more restrained than his more exuberant later work. The external walls are rendered with ‘eyebrows’ over the windows and restrained pinnacles and crenellations, including, most unusually, a single small battlemented pediment on each front. The façade is three bays wide, with a single storied Gothick open porch supported on elegant square columns. Its tripartite arrangement is echoed by the door-case behind. The interior is classically late Georgian, covered with a thin Gothick layer. The large rooms have good plasterwork, a fine wide staircase, and a wonderful set of mahogany doors on the ground floor. Several rooms retain their early wallpaper, dating from the 1830s. 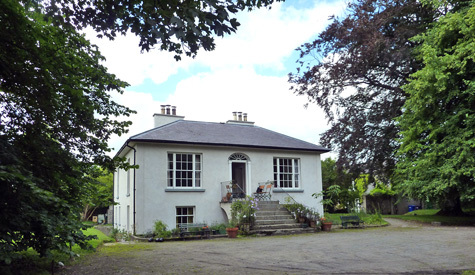 Outside is fine open parkland, with wonderful views of the Galtee Mountains and the Glen of Aherlow, and a superb (and unusually long) avenue of lime trees, dating from the 18th century. The present owners are Jim Nicholson and his wife Kate, who inherited Lismacue from her father, William Baker. Select bibliography ~ Irish Historic Houses Association. The name of CANNING is derived from the Manor of Bishops Cannings, in Wiltshire, where the family was originally seated, and where the senior line continued until it terminated in co-heiresses in the time of HENRY VII. A younger son settled in Bristol in the reign of EDWARD II, and the branch founded by him formed the most eminent family of that city during the 14th and 15th centuries. WILLIAM CANYNGES represented Bristol in several successive parliaments, and was six times Mayor between 1360 and 1390. He died in 1396, leaving, with other issue, JOHN CANYNGES, his son and heir, who was MP for Bristol, and also, in 1392 and 1398, Mayor. This John Canynges died in 1405, leaving three sons and three daughters, all then under age: Thomas, his second son, was Lord Mayor of London, 1456-7; and William, his third son, was the celebrated Mayor of Bristol. 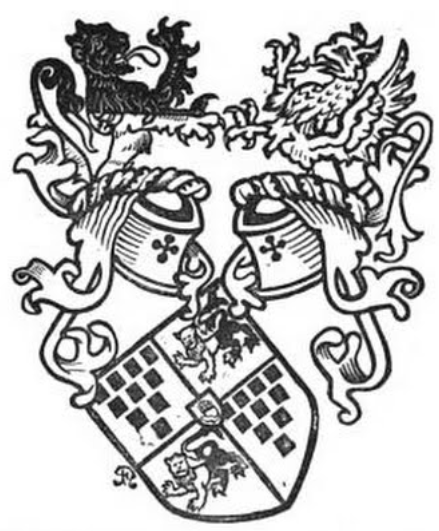 JOHN CANNINGES, the eldest son of John, was the father of THOMAS CANNINGES, who acquired the estate of Foxcote, by his marriage with Agnes, eldest daughter and co-heir of John Salmon. RICHARD CANNINGE, of Foxcote, who married Elizabeth, daughter of Richard Petty, of Ilmington, and had, with several other children, RICHARD, his heir; and GEORGE, ancestor of the BARONS GARVAGH and of the EARL CANNING. Mary; Anne; Jane; Frances; Elizabeth. Mr Canning obtained a grant of the manor of Garvagh, County Londonderry, from ELIZABETH I, and settled there. GEORGE CANNING, of Garvagh, Lieutenant-Colonel, Londonderry Militia, who married Abigail, fourth daughter of Robert Stratford, MP for County Wicklow, 1662, and aunt of John, 1st Earl of Aldborough. Mary; Jane Elizabeth; Frances; Letitia. GEORGE CANNING (1778-1840), who was elevated to the peerage, in 1818, by the title of BARON GARVAGH, of Garvagh, County Londonderry. His lordship wedded, in 1803, Georgiana (d 1804), fourth daughter of Robert, 1st Marquess of Londonderry, by whom he had no issue. Spencer George Stratford de Redcliffe Canning, 6th Baron (b 1953). The heir apparent is the present holder's son, the Hon Stratford George Edward de Redcliffe Canning (b 1990). 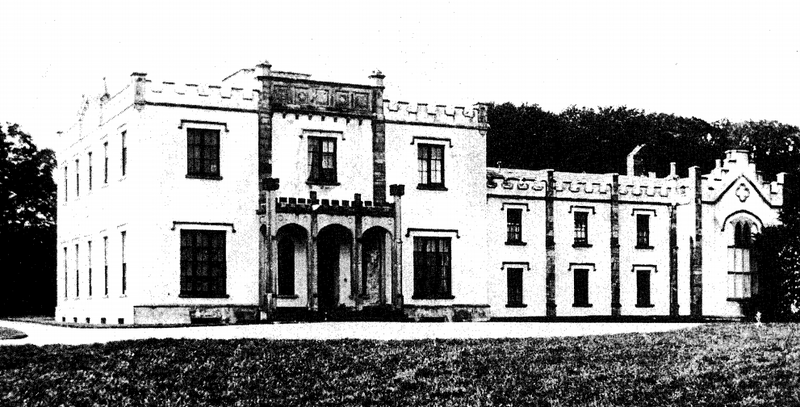 GARVAGH HOUSE is claimed to have been first built in the early 17th century and enlarged twice since then. The house eventually evolved a late Georgian appearance, with a front of three bays between two, three-sided bows and an eaved roof on a bracket cornice. There was a long enfilade of reception rooms, one having a modillion cornice and a Georgian bow; another with a broken pediment of a 19th century appearance over its door-case. When the Canning family sold Garvagh House, it was used as flats for single female teachers, and some classrooms. The house had fallen into disrepair over the years, suffering from wet and dry rot, and vermin infestation. County Londonderry Education Committee decided to demolish Garvagh House and to build a new primary school on its site. This was duly done and Garvagh Primary School opened in 1965. The village of Garvagh is unique in that, unlike other villages in the county, it was not developed by the Irish Society, nor was it an ancient settlement. It is, in fact, a private plantation; that is, a town set up over a period of nearly 300 years and developed by the local Lords of the Manor, the Cannings. 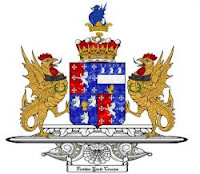 The family association with the Garvagh area began in 1615 when George Canning, of Foxcote in Warwickshire, was appointed the Agent for the Ironmongers' Company of London, a company actively involved in JAMES I's Plantation of Ulster. To begin with, the townland of Garvagh was not part of the Ulster Plantation, as it had been granted to Manus O'Cahan, the local Irish chief, as a native freehold. After the Great Irish Rebellion of 1641 the situation changed, when O'Cahan joined forces with Sir Phelim Roe O'Neill in the insurrection and, as a result, he lost the freehold. In 1649, one of George Canning's sons, Paul Canning, acquired the townland of Garvagh and began to develop it, by first building St Paul's parish church, which initially was intended as a private chapel for him and his family. 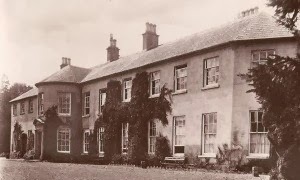 The Canning family continued to play an active part in the development of Garvagh until 1920 when they sold the estate and moved to England, exactly three centuries after they had established the first village. The Garvagh Estate formerly extended to 8,427 acres. Garvagh lies between Coleraine and Maghera. There is a museum and heritage centre in the village. Covering over 550 acres, Garvagh Forest is situated on the Western outskirts of the village, with trees from over 80 years old to those only planted at the turn of the century. The final unusual habitat in Garvagh Forest is the Garvagh Pyramid, created as a burial chamber for Lord Garvagh in the 19th Century. Unfortunately the pyramid was never allowed to fulfil the task it was designed for and was sealed shut, with no incumbent, a number of years ago. First published in February, 2010. The old school pal, Dangerfield, invited me to a Burns Supper at the family home five years ago. The weather conditions were poor, though I finally managed to reach his house, a mile or two outside Broughshane, County Antrim. I'm apprised that they have a hundred and forty acres. We had a terrific time. As can be seen by the photograph - Dangerfield had lent me a Royal Irish Rangers caubeen with its green hackle - I was slightly the worse for wear; so I was glad to have a room for the night. The grub was delicious: wholesome chicken or pheasant soup; venison stew with haggis; chocolate and Cranachan pudding; whisky; abundant wine. Shortly after the proceedings the drone of the bagpipes could be heard and Gavin marched in. He must have learnt to play them in the CCF band at Campbell. One of the house guests, Michael, is an accomplished musician and played the piano for us all. He's another Old Brackenbrian, so I hope see him at the next annual dinner in the Ulster Reform Club. I retired to bed at some unearthly hour, perhaps three-thirty the next morning. We breakfasted in the conservatory: venison sausages, rustic bread, mustard, marmalade, mushrooms, tea. First published in January, 2013. OVERINGTON BLUNDEN, of Southwark, London, who, in 1667, was granted Glenmore, "to be for ever called Blunden's Castle", and other lands in County Kilkenny, Queen's County and County Waterford. JOHN BLUNDEN (c1718-83), only surviving son of John Blunden, of Castle Blunden, MP for the City of Kilkenny, by Martha, daughter of Agmondesham Cuffe, and sister of John, 1st Baron Desart, was created a baronet in 1766, denominated of Blunden Castle, County Kilkenny. Sir John was a distinguished member of the Irish bar, and represented the City of Kilkenny in Parliament. Rowena Mary; Elizabeth Anne Gabrielle; Fiona Christine. At the end of the 18th century Sir John Blunden built Blunden Villa near the gates of his family home, just outside the mediaeval city of Kilkenny. By family tradition this elegant Georgian villa was built as a dower house for Sir John’s mother, the daughter of a neighbour, Lord Desart, to provide her with her own establishment when he married and brought home his heiress bride. Blunden Villa is a delightful small Regency house with a high ground floor above a semi-basement. The façade is of three bays, with the front door at the upper level approached by a wide flight of stone steps with contemporary iron railings. The door is surmounted by a fanlight and has delicate Wyatt windows to either side. The plan is very slightly over square, as the façade is marginally shorter than the width from front to back, while the interior has high ceilings and well-proportioned rooms. For many years Blunden Villa was used as a gate lodge to the principal house, but in 2006 Jane and Caroline Blunden, twin daughters of the 6th baronet, decided to restore the building, which is now their Irish home. This family is of ancient French extraction. About 1580 a cadet of the family, having embraced Huguenot opinions, fled to England and settled in the Isle of Purbeck, Dorset, where he was living in 1613. ROBERT DOLLING, left the Isle of Purbeck and established himself in London. Mary Radclyffe; Emily Jane Saunders. Nina Caroline; Josephine Maud; Ulrica Douglass. Ulrica Margaret; Mary Noel; Dorothea Cecil. 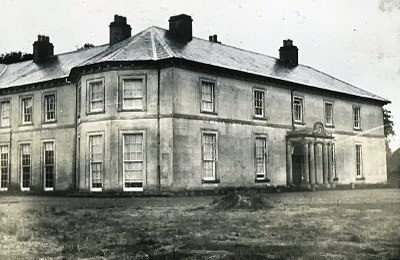 HARRY HOLBECHE RADCLYFFE DOLLING (1893-1986), wedded, in 1970, Hazel Marion (1923-2006), elder daughter of Sir Robert George Alexander Staples, 13th Baronet, of Lissan House, County Tyrone, though the marriage was without issue. Former seat ~ Edenmore, Magheralin, County Down. The elder branch of this family was ennobled, in 1663, by the title of EARL OF STIRLING, in the person of WILLIAM ALEXANDER, of Menstrie, Clackmannanshire. The name of ALEXANDER was assumed from the Christian name of its founder, Alexander Macdonald, of Menstrie. 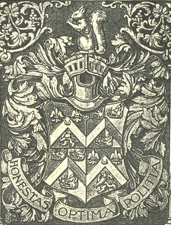 This branch, on removing into Ulster, adopted into the family shield the Canton charged with the Harp of Ireland, and settled at Limavady, County Londonderry. ANDREW ALEXANDER (1625-), of Ballyclose, Limavady, County Londonderry (attainted by JAMES II, 1689), who wedded firstly, Jessie, daughter of Sir Thomas Phillips, called Governor Phillips, and had a son and heir, JACOB. He espoused secondly, a daughter of the Laird of Hillhouse, and had a son, JOHN, ancestor of the EARLS OF CALEDON. SAMUEL MAXWELL ALEXANDER JP DL (1834-86), of Roe Park, High Sheriff of County Londonderry, 1858, espoused, in 1884, Henrietta Constance, daughter of Sir Frederick William Heygate, 2nd Baronet, though the marriage was without issue. 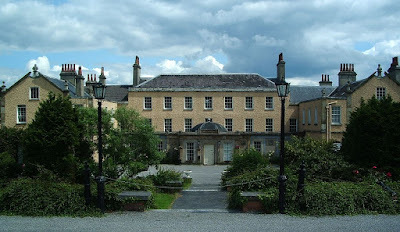 In 1697, Sir Thomas Phillips' holdings, which included Roe Park, were sold by his grandson to the Rt Hon William Conolly, who came to live in Phillips' new house in Limavady, County Londonderry. 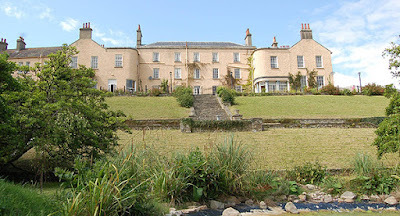 When Speaker Conolly sold his estate to Marcus McCausland in 1743, the McCausland family greatly improved the house (and changed the name to Daisy Hill), by creating the five-bay structure which still forms the current frontage. Roe Park's principal features are a three-sided bow with a curved, pedimented and pillared door-case. The drawing-room and dining-room have fine Victorian plasterwork. There is a large and imposing pedimented stableyard. In 1782, Marcus McCausland's son, Dominick, inherited the estate. He added a fine dining-room and built substantial office buildings, which included a coach-house designed by Richard Castle in 1784. This building still stands today and houses the Roe Park hotel's restaurant and golf shop. Dominick McCausland also extended the estate by purchasing adjoining town lands on both sides of the river. He proceeded to plant thousands of trees on his estate. He also built a ten-foot wall to surround part of the estate - parts of which are still visible today - and a foot bridge (known locally as The Spring Bridge) so that he could service the well which supplied fresh water to the house known as Columba's Spring. During this time, it's likely that the walled garden (now the golf driving-range) and gazebo were built. This gazebo was slightly bigger than it is today and was the home of the estate's head gardener until the 1950s. In 1817, Daisy Hill was sold to John Cromie, of Portstewart, who renamed the house Roe Park. Mr Cromie, in turn, sold the estate to Sir Francis Workman-Macnaghten Bt for £11,500. Mr Rennie mortgaged the property to Harvey Nicholson, of Londonderry, who came into possession of the estate during 1850. In 1872, the estate was bought by Samuel Maxwell Alexander for £12,150. Mr Alexander, a distant cousin of the Earls of Caledon, married Henrietta Constance Heygate, daughter of Sir Frederick William Heygate Bt, in 1884. As this gentleman brought extensive lands from his own estate, this extended Roe Park to 5,229 acres. Mr Alexander died in 1886, but as he had no immediate family, the estate was left to his two nieces. The part that included Roe Park was bequeathed to Elizabeth Jane Stanton who, in 1887, married John Edward Ritter; thus Roe Park came into ownership of the Ritter family. Mr Ritter died in 1901 and the estate passed to his widow, who managed it until she died in 1926. The estate then passed to her son, Major John Alexander Ritter, Royal Artillery. Major Ritter continued to manage affairs until his death in 1931, followed by his widow, Mrs Ritter, until her death in 1951. When Mrs Ritter died, the estate was sold again. Alas, it was at this time that the estate was stripped of many of the fine trees planted by Dominick McCausland in the late 1700s. Roe Park House was converted into a residential care home, which closed in the late 1980s, when the house and lands were purchased and developed into the current Roe Park Hotel. THE first mention we find of the ecclesiastical Province of Dublin is in the 7th century. In 1152 it was made an archbishopric. In 1214 the bishopric of Glendalough, which had been founded in the 6th century, was incorporated with Dublin. It is 64 miles in length from north to south and 46 in the greatest breadth; containing the entire county of Dublin, most of County Wicklow, and part of two others. The Archbishops had a Dublin residence at 16 St Stephen's Green. TALLAGHT CASTLE, according to the Parliamentary Gazetteer of Ireland, was originally a castellated edifice of considerable strength, and eventually a modernized and plain mansion. 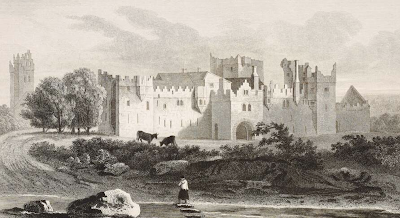 Alexander de Bicknor, Archbishop of Dublin, 1317-49, established Tallaght Castle in 1324; though it was erected as a means of protection for the town rather than an archiepiscopal residence. In the mid 1400s, improvements were made by Archbishop Tregury, leading to an increase in usage by subsequent Archbishops. Archbishop Hoadly built a palace on the remains of the original castle from 1727-29. The grounds had a brewery, granary and stables. The structure itself was a spacious but long and narrow building, made of grey stone, and remarkably austere. The interior contained many apartments of ample proportions, though none were highly embellished. The hall, entered by a flight of stone steps, measured 21 feet square, and was lit by two tiers of windows. The dining-room was 25 feet long by 21 feet in width, and was adorned was the archiepiscopal coat-of-arms, "impaled with a shield quarterly, charged in the first quarter with a pigeon". 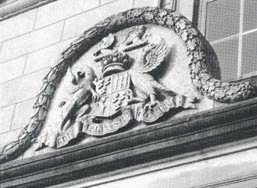 These arms bore the date 1729, and above was the crest, a "hawk perched on a round ball". Underneath the armorial bearings was the inscription "JOHANNES HOADLY, HANC DOMUM REFECIT." The great drawing-room or saloon, measuring 33 feet by 21, contained the only portrait in the palace - a full length of Archbishop Hoadly, who was translated the the See of Dublin in 1729. The library was a small room with a large window, from which, as with all the windows of the reception rooms, very fine views were afforded of Montpelier Hill, County Dublin, and the adjacent tract of beautiful scenery. The gardens were designed with "unpleasing formality"; though the historian would have derived some gratification from finding the remains of a tower, an integral part of the original palace. By 1760 some of the buildings were said to have become dilapidated. Archbishop Fowler, translated to Dublin in 1778, surrounded the demesne with a wall and made other improvements; though it was judged that the situation of Tallaght was unfavourable to residence of the Archbishops; and the palace was, eventually, forsaken by its dignified owners. Tallaght, in the 18th century, was said to be "rendered ... undesirable by the depredations of outlaws and robbers, who have peculiarly infested this neighbourhood." In 1803, the anglican Archbishops of Dublin ceased to reside at Tallaght. An Act of Parliament was passed in 1821 which declared that the palace was unfit for habitation. In 1822, it was sold to Major Palmer, Inspector-General of Prisons, who pulled most of the palace down and used the materials to build his mansion, "Tallaght House", as well as a schoolhouse and several cottages. A tower from the original castle was left untouched and later was incorporated in the current priory building. When the Dominican friars took a lease out on the property in the 1840s one of the buildings was converted into a chapel. This was replaced by a purpose-built church in 1883. Part of the house burned down in the first decade of the 1900s.